COLUMBIA, Mo.— The University of Missouri’s School of Journalism, Office of the Provost and the Mizzou Advantage initiative announce today a new, immersive education-industry recruiting and training effort designed to increase the representation of underserved communities in journalism and strategic communication. “We’re proud to be a national pioneer and leader in tackling issues related to diversity and inclusion,” said Dean David Kurpius. What makes this pilot program unique is that it covers the key stages of the talent life cycle of the media industry — from high school to college to the first years of a career. The interdisciplinary effort includes recruitment, partnerships, mentorships and research. “My office has chosen to fund the Student Development, Diversity and Recruitment Program to ensure diverse students’ success not just through their college years, but also through the beginning stages of their careers,” said MU Provost Garnett Stokes. “Once this program is successful, it will provide a model that could be duplicated in other schools and colleges. Diversity has been an important but elusive goal in newsrooms and agencies. It will become even more important as demographics continue to shift and, according to the Census Bureau, minorities become the majority in the United States by 2044. In a letter of support to MU Provost Garnett Stokes, Ramon Escobar, the vice president of Talent Recruitment and Development for CNN Worldwide, said the new program is an important step in bringing new voices to journalism. Escobar earned his Bachelor of Journalism degree from the School in 1990. Another supporter, Kevin McDonald, the Chief Diversity, Inclusion and Equity officer for the University of Missouri System and interim vice chancellor for Inclusion, Diversity and Equity for MU, said inclusion is a part of excellence and the university’s role as an enlightened academic community. “We recognize the value of boldly pursuing full inclusion as a central component of our values and our approach to each other and the world around us,” McDonald said. Ron Kelley will be the executive director of the program and will seek partnerships from leading news and strategic communication companies, some of which have shared their need for diverse candidates. Kelley will also develop external funding and other channels of support, as well as lead the School of Journalism’s diversity initiatives. He will leave his current position as MU assistant vice chancellor for advancement and begin his new position at the School on Sept. 12. He earned his doctorate in educational leadership and policy analysis at MU in 2000. Mizzou Advantage, the MU Office of Inclusion, Diversity and Equity, and the School of Journalism will contribute personnel, facilities and financial resources to help establish and operate the new program. The Student Development, Diversity and Recruitment Program builds on the School’s decades-long efforts to connect people of various races, ethnicities and backgrounds. 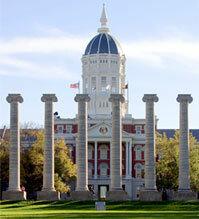 Missouri was one of the nation’s first programs in the country to offer a course in cross-cultural journalism in 1998. Earlier this year, faculty and alumni published an introductory textbook to help students write about and communicate with people of backgrounds different from their own.